The lovely Gemsmaquillage mentioned in this video, saying that she had purchased the Nuxe Creme Fraiche mask following a recommendation I made to her a long time ago. I actually need to credit Laura from BuynowBloglater and this post for my interest in the the Creme Fraiche range. I have loved Nuxe for a long time but I really can't say I've tried everything from their very large range. 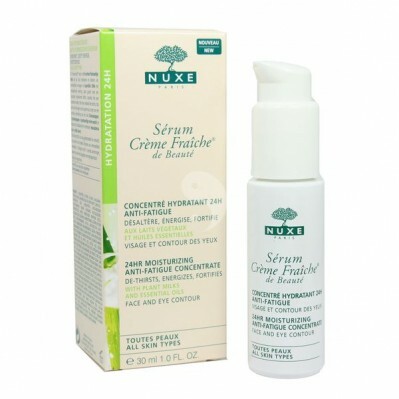 I am, however, a huge fan of the Creme Fraiche Serum that I've been using for a couple of months now, and I realize I didn't tell you about it! So let's make up for that right away. This product is an ultra-concentrated serum, a real source of beauty, that helps to moisturize and soothe the skin continuously over 24 hours. This product has a texture that melts instantly upon application, leaving the skin fresh and replumped. Helps to reinforce skin's moisture levels. Soothes skin and reduces discomfort and irritations. 94.1% of the total ingredients come from natural origin. I use this serum in the morning (at night I use the Estee Lauder Advanced Nice Repair) under a bit of light moisturizer and then makeup. You can, however, use this twice a day including around the eyes. It feels absolutely lovely on the skin with its lightweight, almost lotion-like texture, and it does smell of flowers but the smell doesn't linger for too long (which you know I hate because it's migraine inducing for me). It does absorb quite fast and leaves the skin with a pretty glow, the kind that comes from hydration and not grease. It is an excellent base under my makeup and doesn't make my base slide off or my face look shiny. It also does its hydrating job very well. All in all, I find this to do a better job than the Avene Soothing Hydrating serum, which is heavier in texture but not at all more efficient. Now that I am hooked on the serum I will definitely the other Creme Fraiche products a try. I've only tried a couple Nuxe products (love their lip balm, and thanks for introducing it to me!) but this one sounds lovely. I'm soothed just reading about it! Ooh this sounds like something I would absolutely love! I've not tried anything from Nuxe before but I've been hearing a lot of good things!